We set out heading west from the industrial town of Rio Grande along Route B. 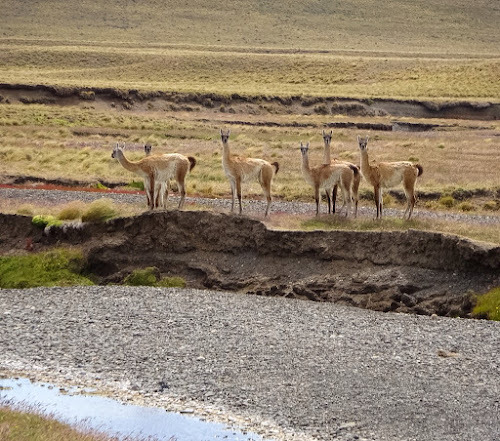 The desolate and unpaved road would take us west across the Land of Fire to the town of Porvenir. Once there, we would ride a ferry across the Straight of Magellan to Punta Arenas, at the southern tip of mainland Chile. Most cyclists take the most direct road between Rio Grande and Porvenir, and most cyclists head from north to south to benefit from the strong tailwinds. These are the "smart cyclists" -- the ones who are up for a more "comfortable" means of traveling. We're the not-so-smart cyclists. It's hard enough cycling with a fully loaded bike that hovers close to 80 pounds. 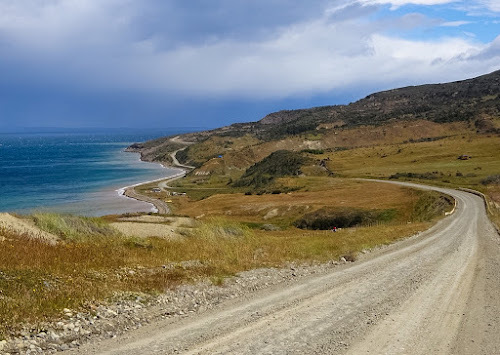 But add to that riding on unpaved roads...and add to that steep grades...and add to that the occasional cold, drenching rain storms...and add to that a headwind that blows between 20 and 40 miles per hour, and you've got yourself a perfect recipe for six days of hellacious riding. Let's start with the bikes. My bike alone weighs nearly 38 pounds. With my camping gear, six days of food (none of which is in dehydrated form), and eight liters of water, my bike and its load easily weighs 80 pounds, and quite possibly even more. Add to that the unpaved roads. 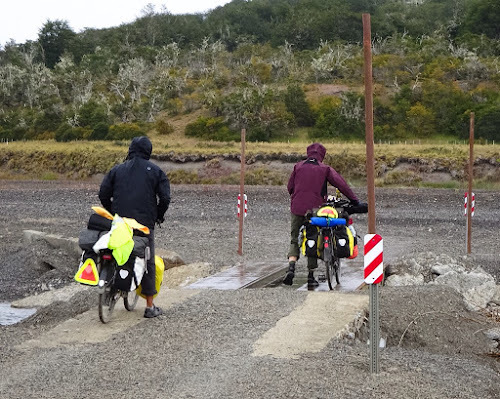 Occasionally, the route proffered a decently smooth tread, allowing a narrow path in which we could comfortably navigate our bicycles. 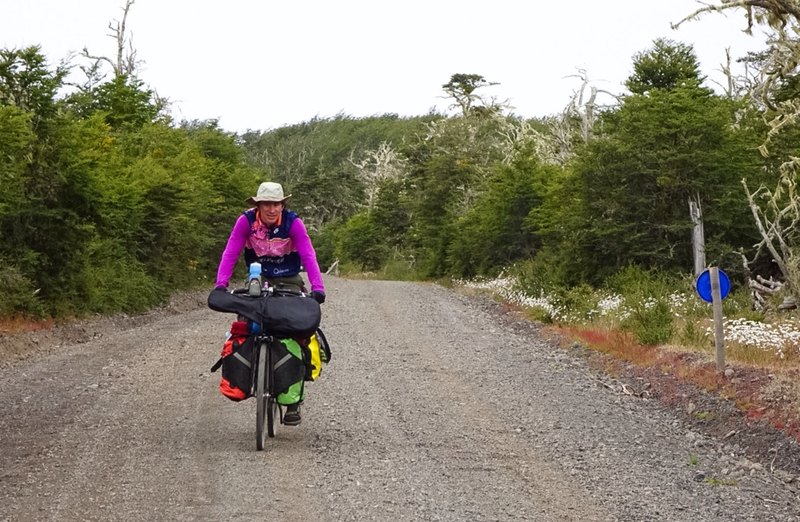 At other times, the unpaved road was doused in thick piles of gravel, which made for slippery and unstable pedaling. 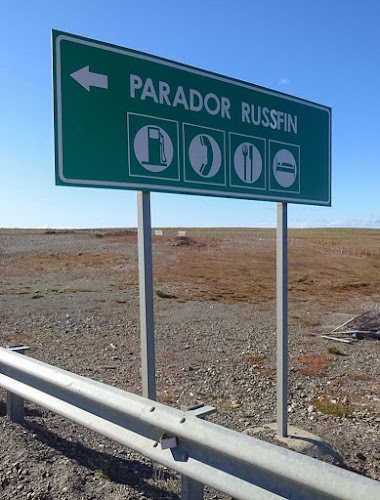 Then there were the kilometers upon kilometers were encountered that were full of washboard treads; our eyes and brains busily scanned the road, looking for the least evil of the monotonously bumpy surface. Add to that the steep hills. Though short, many of the hills easily exceeded a 15% grade. They reminded me of the steep roads in Seattle that cyclists go out of their way to avoid. I'm absolutely certain, without the slightest hesitancy of a doubt, that no cyclist has ever contemplated grinding up one of those beasts carrying an 80 pound load. There was the weather, too. Fortunately, most of the riding hours presented us with clear blue skies. Though the temperatures called for pants and jackets, the wind was a warming factor. On the last two days of our trip, we had to contend with long dark rays of rains that streaked from the sky. Though our fancy Goretex fabrics claim to be waterproof, let's be honest -- everything eventually gets soaked when exposed long enough to a downpour. We were quite pleased, however, with our clever glove solutions. 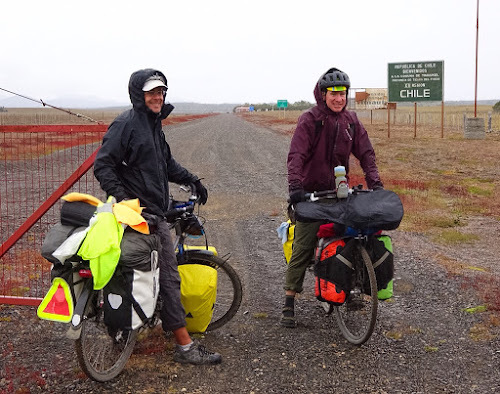 Rather than forking over big dollars for fancy technical gloves that would have eventually given into the rain like our other waterproof wear, we found that our $3 chemical protectant gloves over a wool glove liner kept our fingers toasty warm and toasty dry for the long haul. And to top it all off, there was the mother fu$&#% wind! Wind is the ultimate enemy for a cyclist. Though I despise winds as a cyclist, as a sailor, I have an appreciation for winds. 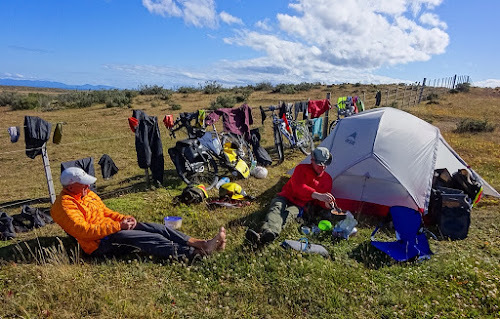 There are, after all, two types of days: 1) days without wind, which are optimal for cycling, and 2) days with wind, which are optimal for sailing. 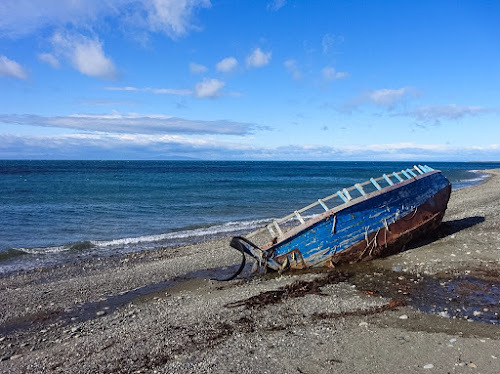 But, oh my god almighty, the winds we experienced in Tierra del Fuego would have quickly dismasted a sailboat. When I learned to kitesurf last year, I was surprised at how fast the winds needed to be moving in order to generate enough wind to keep a kite aloft. Surprisingly, the optimal kitesurfing winds were quite a bit speedier than the conditions for sailing. 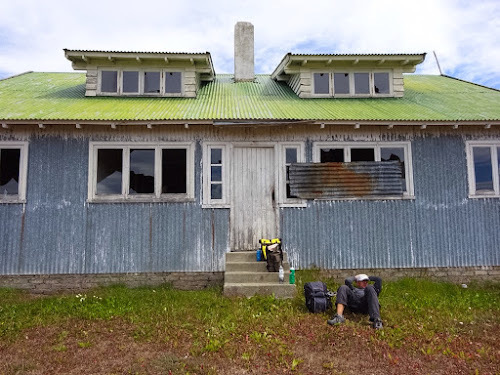 The winds we experienced in Tierra del Fuego would have undoubtedly lifted a kite surfer into the sky, never ever again to be returned to the earth. There was a part of me that wished I had more ballast to help keep me steadfast against the wind. None of us Three Masochistic Muskeeters have ever biked in such atrocious winds. 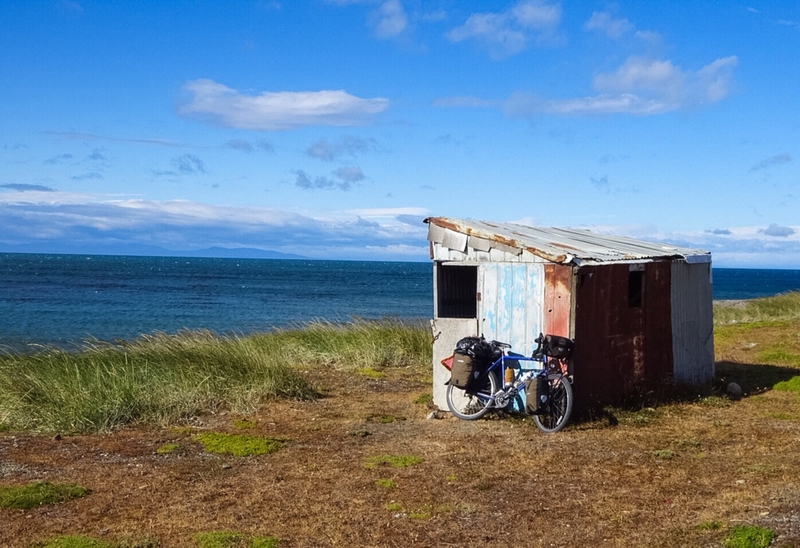 There were moments -- many of them -- when the winds knocked us off our bikes. And there were moments when the winds were so strong that we couldn't propel our bikes forward. Though Tío Ramón and El Mecánico may disagree, I was grateful for the ramp-up in the winds. The first day was windy and seemed like it couldn't possibly get any worse. 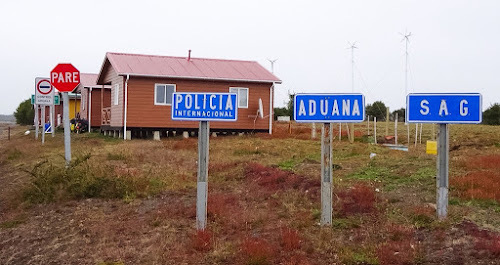 The winds on second day were indeed worse and seemed comical when the guards at the Argentian border crossing told us that the day had "poco viento" (little winds). 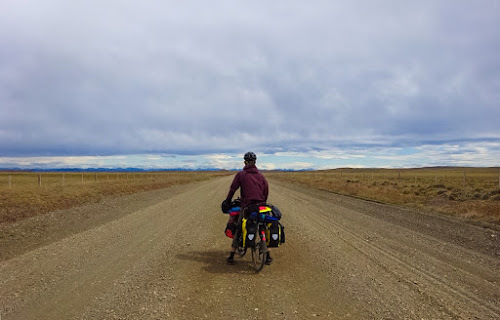 The following days the winds were stronger yet; it required every muscle in our bodies to keep the bicycles within the one foot of reasonable riding tread on the increasingly gravel-filled roads. On the fifth day, storms were added to the mix. And on the final day of riding, we had the opportunity to fully experience the horrendous winds at the end of the world, in all of the reputable glory. Although I muttered many bad words that would have earned my mouth a soap washing in my childhood days, I will admit that there were times when a masochistic smile spread across my face. "You gotta be kidding me. I can't even pedal my bicycle. This is hilarious." My climbing friends classify their fun as either Type 1 or Type 2 fun. Type I is when you are having fun in the moment. Type 2 is when you're not having fun in the moment, but when the activity was fun when viewed in retrospect. For me, our ride through Tierra del Nada was a Type 1.75 fun. The ride didn't quite earn a Type 2 rating because of the views. I thoroughly enjoyed the stark landscapes that continually changed as we turned a corner or as we reached one peak and lowered into the neighboring valley. The simplicity of the vistas allowed for greater appreciation of each flower, each tree, each animal, and each human-made structure, all of which were few in numbers. Alas, at the end of day six, we arrived at our destination -- exhausted but having conquered Tierra del Fuego. 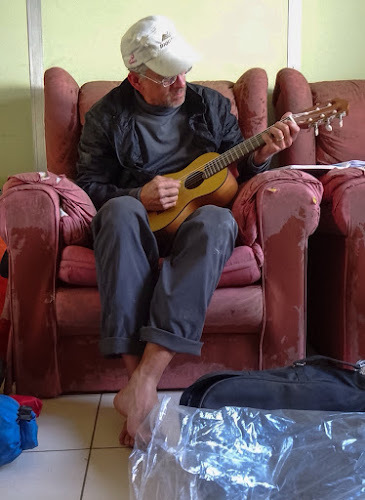 I felt relieved to hear El Mecánico, who has a plethora of cycling experience, say that the last few days had been the hardest riding of his life. Indeed, they were hard days. But that's what adventure is all about. Though strength is a factor, it's really all about mental fortitude. Mental fortitude can withstand any masochism. 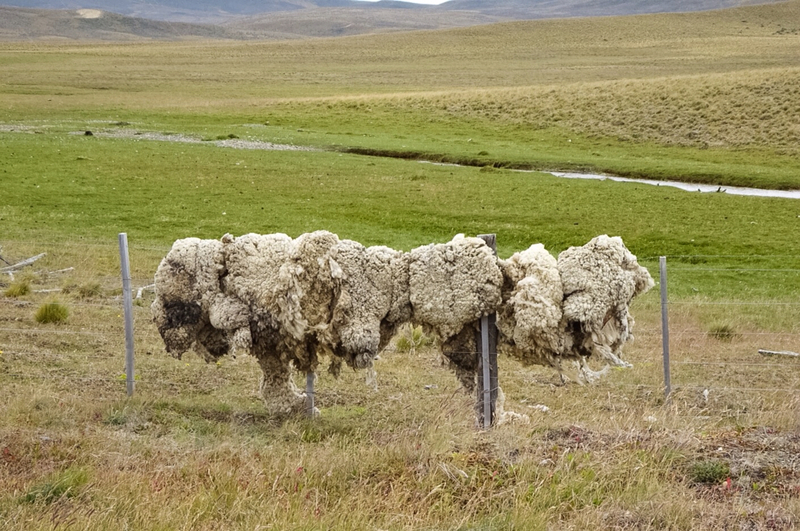 We saw many sheep skins hanging atop fences. We found a number of desolate homes along the route where we could escape the winds while eating our lunches. 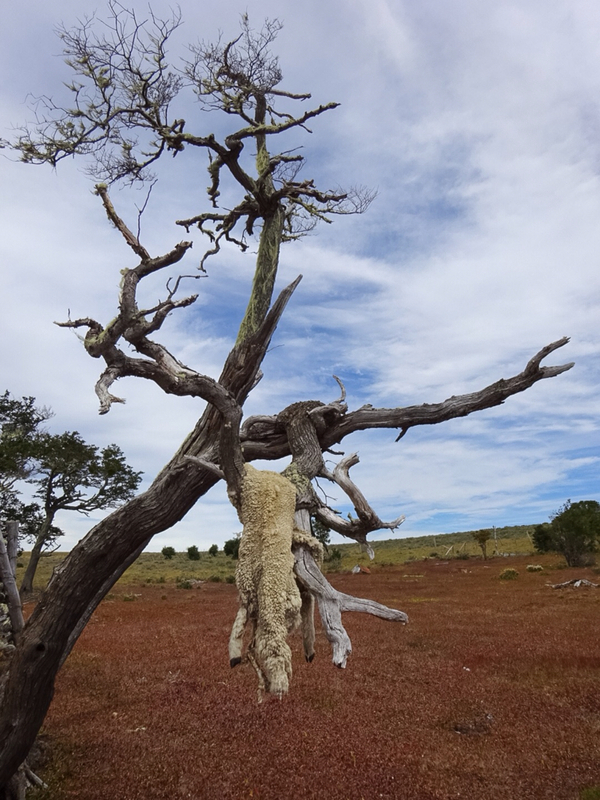 Another sheep skin, hanging from a tree on a deserted ranch. 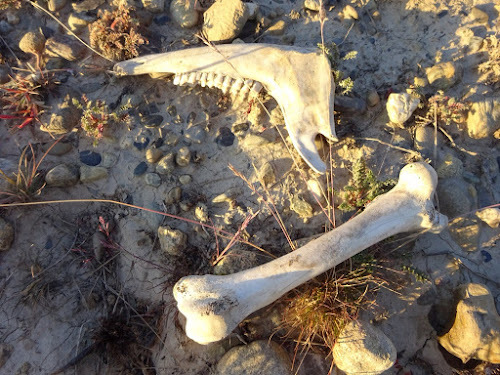 At one roadside camp, we needed to clear away the rocks and bones so that we could find a smooth enough spot to lay the footprint of our tent. There were dead animals, in various stages of decay, littered all over Tierra del Muerte. 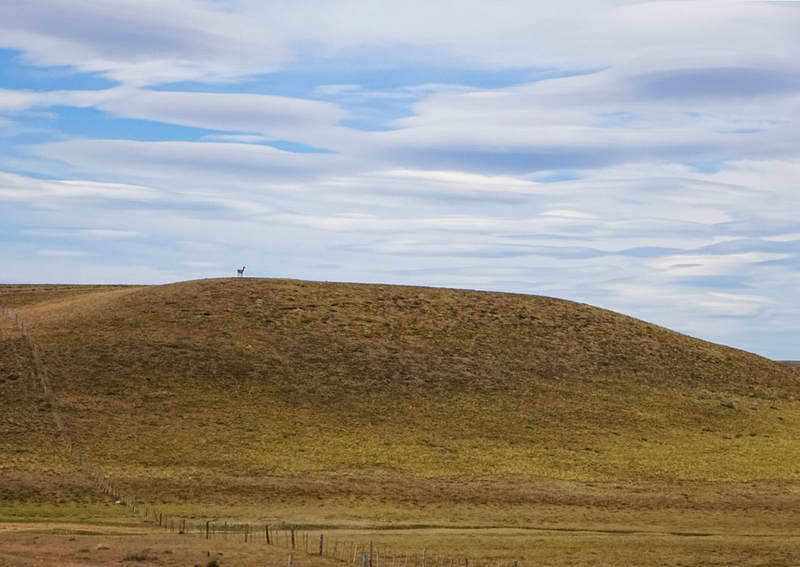 A sole, curious guanaco watches us from a hilltop. Craig writes in his journal from one of our roadside camps. Tío Ramón plays the theme song from "Deliverance." Signs indicating International Police, Customs, and SAG at the Chilean border. We laughed that SAG means the Chileans will provide sag support for our bike ride. El Mecánico bikes through a forested section of the route. 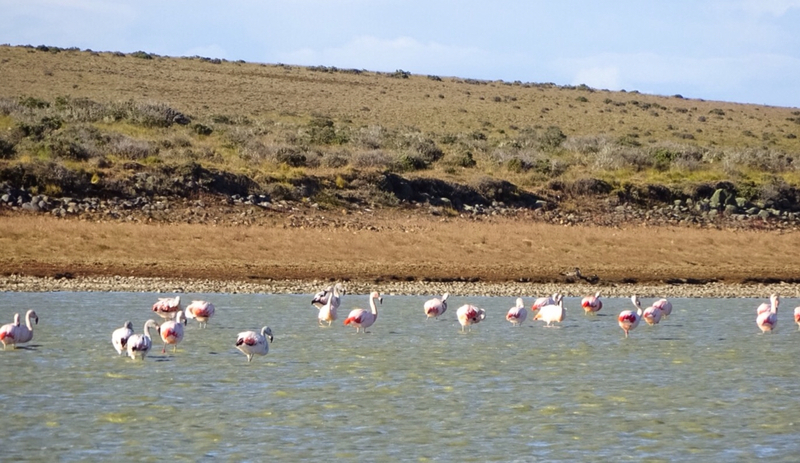 As we came around the corner, we spotted a flock of flamingos in a lake. I threw my arms up in the air and shouted, "Woohoo!" 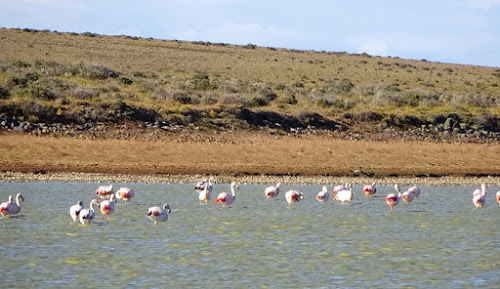 Indeed, it is true that flamingoes live in the Land of Fire. We learned the hard way not to expect a 7-Eleven-type of services when seeing a sign that looks like this. Had we been truly desperate, we could have scrounged up some resources in Russfin. 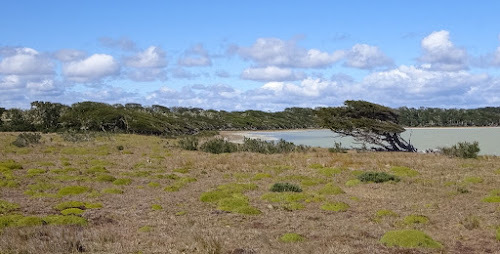 The strained angle of the trees surrounding this lake are a telling sign of the continuous winds that blow across Tierra del Fuego. We exposed the camera to the rain just long enough to snap this lonesome, wind-drugged tree. 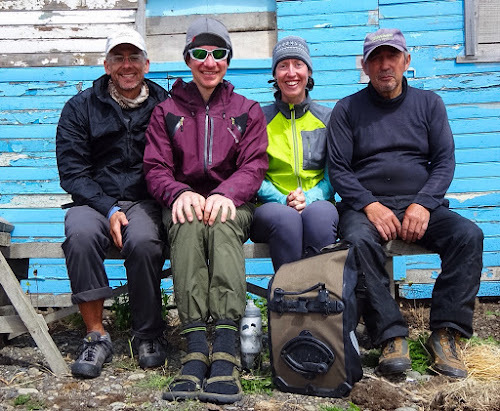 We were greeted by Bahía Inútil ("Useless Bay") at the far western side of the island. 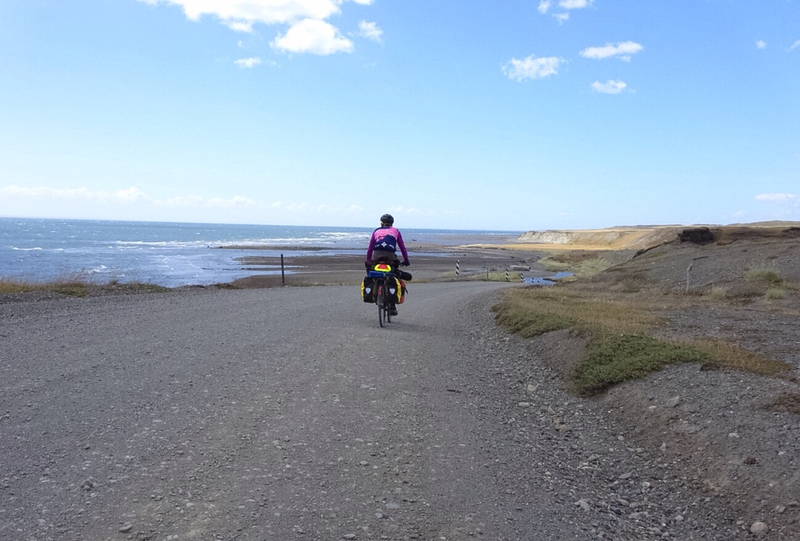 Riding along Bahía Inútil reminded me very much of riding down the Pacific Coast of the United States, only the Bahía is far more pristine and has far less traffic. 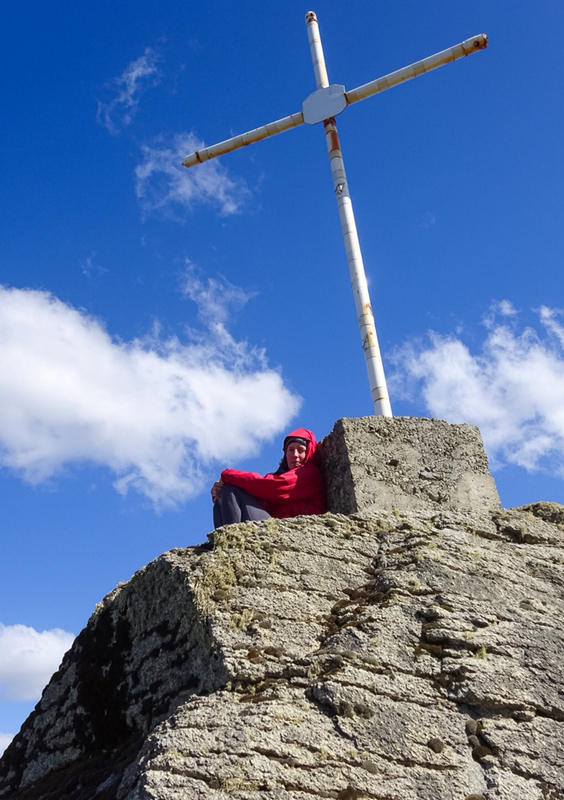 Me, seeking solace against the wind. We spent one night camping beneath the underside of a huge rock, sheltered from the wind. Fred Flinstone graffiti on the inside of an abandoned gaucho hut where we ducked out of the wind and rain to replenish our lost calories. 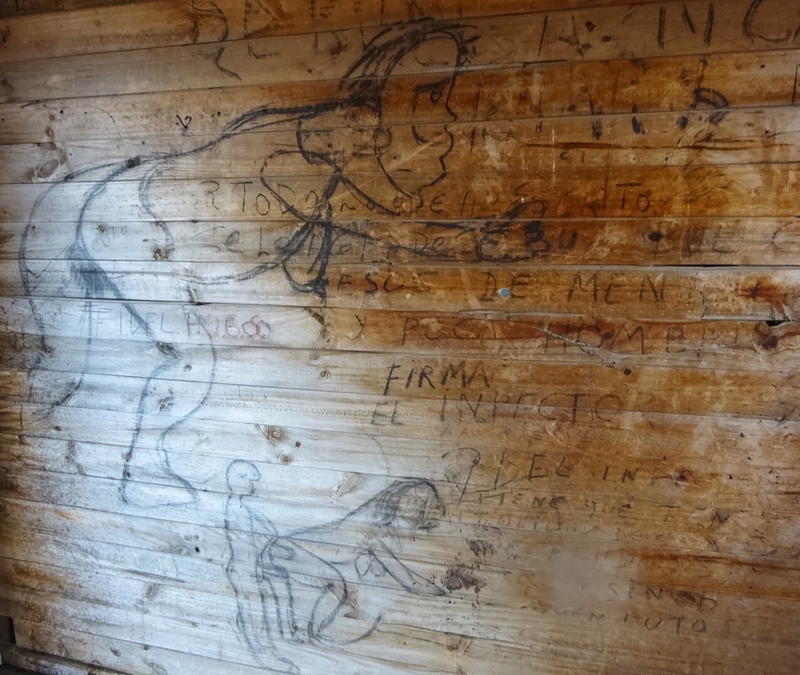 Some more "colorful" graffiti on the inside walls of the hut. Another one of our roadside camps. We stopped here after we were debilitated by a torrential storm with winds so strong that we could no longer bike. A half hour later, the skies turned a perfect blue, and we were able to quickly dry our rain soaked clothes on the fence. ...as Shirley rests peacefully against a beachside shack. Tío Ramón, El Mecánico, Saracita, and Carlos. 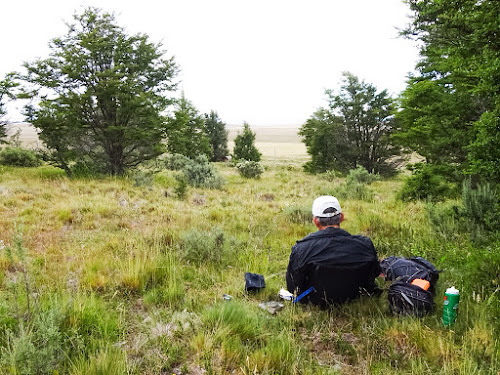 We saw Carlos working in a garden outside of Estancia Fortunata and asked if we could eat our lunch on the side of his shed, sheltered against the wind. Carlos made us a delicious salad (time will tell if the lettuce was washed in water amicable to our stomachs) and patiently conversed with us in our broken Spanglish. 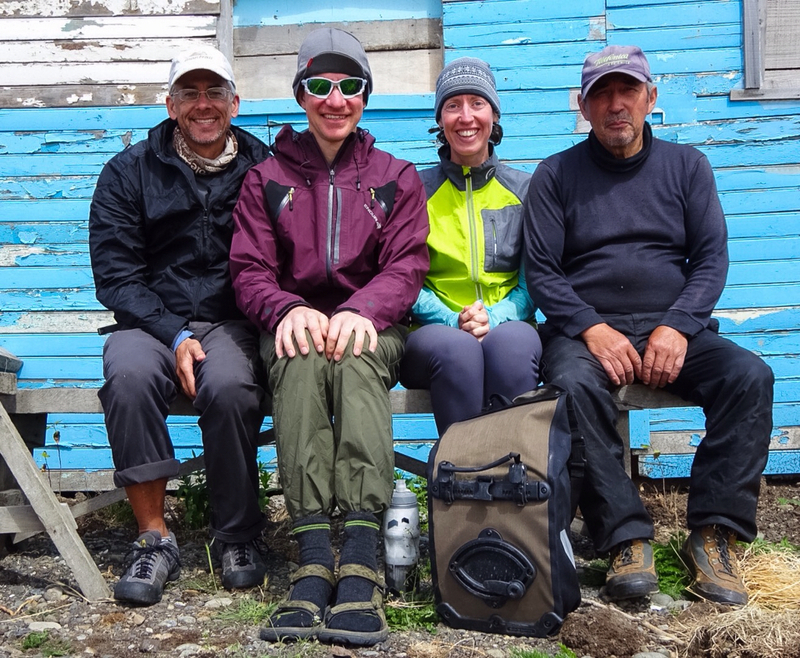 Carlos has shared his hospitality with numerous cyclists and hikers who have passed by his home. 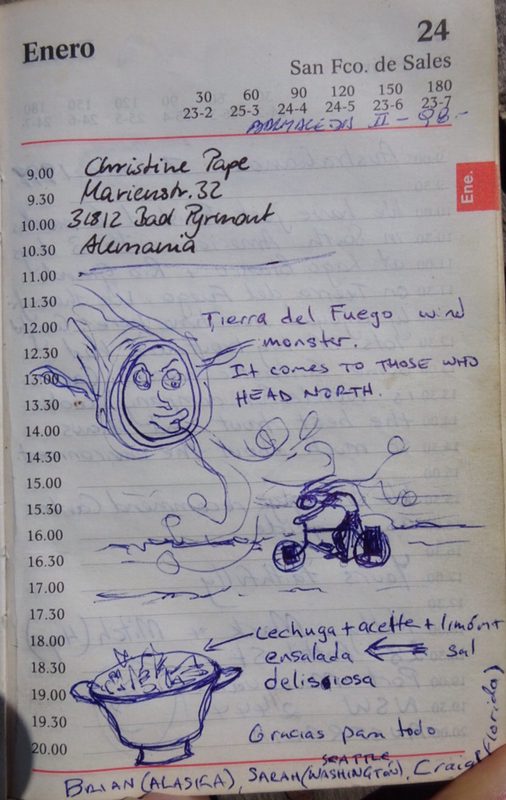 We left evidence of our visit in Carlos's calendar book, which serves as his guestbook. Yeah, there's been no shortchanging. We've definitely gotten our money's worth. Never a situation too hard too overcome--that's my girl! Though this one may make the record books. Didn't the coaches always preach "NO PAIN; NO GAIN"? In case that never made sense before, it probably does now. I am loving living this tour through the three of you. Thanks, Mom. There indeed has been a lot of gaining on this trip. Oh man! What an awesome ride! It speaks to your attitude that you classified this as type 1.75 fun instead of type 2. Love this, keep posting the updates! Wow.... 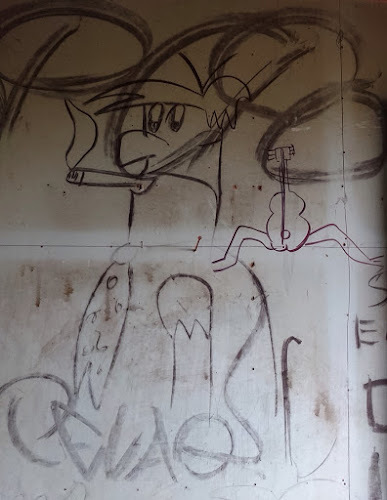 I have had what I thought were level 2 fun days. 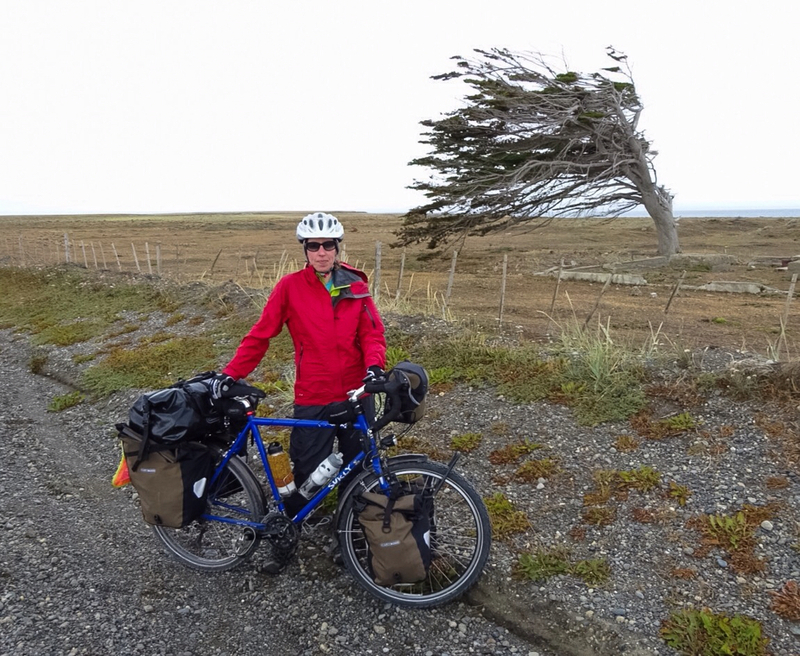 I might have to rethink that... That picture of the tree is enough to let us know what the winds must be like... And for you to say it was the toughest riding ever, it has to be hard! 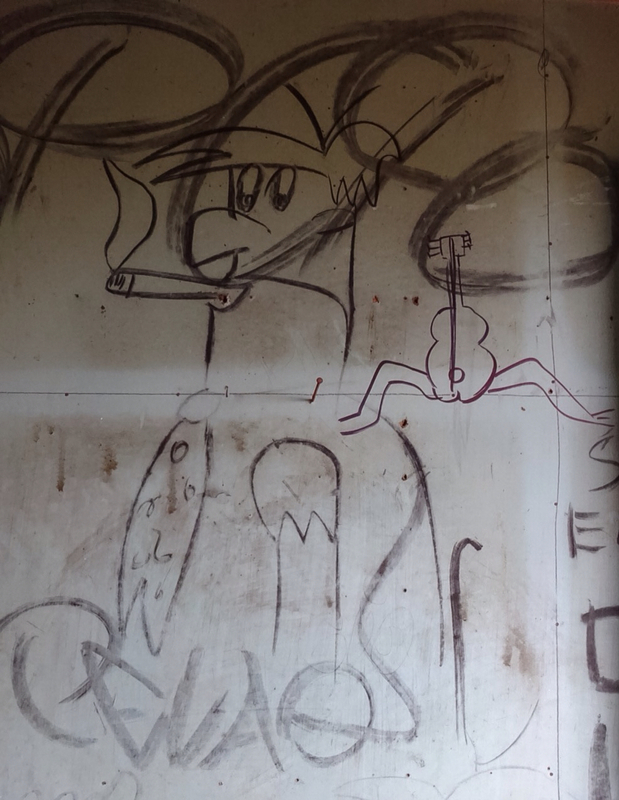 I've never met anyone who has gone across the Strais of Magellen, Jr Hi geography Tony is in awe of you! Jr Hi Geography Tony? Ha! :) You're a hoot! So happy to be snuggled up with a blanket on the couch. Oh yes, I am an eye indoor girl. Such great pics, I was sweating just looking at the pictures of you biking in that wind. Keep up the adventure and the blogs they are great and keep us connected from the other end of the world. Awesome pics! Love following your adventure! And no, you can't reroute our Pacific Coast Tour just so you can ride into the wind...crazy nut! No worries on the rerouting, Osika. Not only will our riders be riding with the tailwind, but I'll also be attaching an industrial-sized fan on the front of the van and driving closely behind to help ease the ride.